Celebrate National Strawberry Ice Cream Day! Photo courtesy Waitrose. January 15th is National Strawberry Ice Cream Day. 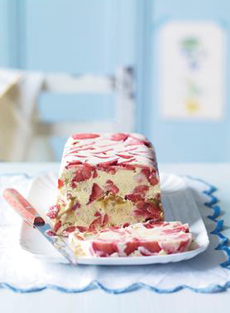 We love this easy strawberry ice cream cake adapted from British upscale grocery giant Waitrose. The company has a royal warrant to supply groceries, wine and spirits to Queen Elizabeth II and to Prince Charles. In this recipe, shortbread cookies substitute for the cake; but if you prefer, you can substitute finely cubed pound cake. You also can use strawberry ice cream instead of the vanilla. This dessert is also spot-on for Valentine’s Day, Mother’s Day and summer celebrations. Prep time is 15 minutes plus several hours or overnight for freezing. 1. THINLY SLICE 4 of the strawberries and roughly chop the remainder. Line a loaf pan with a double layer of plastic wrap, allowing for some overhang. Arrange the sliced strawberries on the bottom (it will become the top when unmolded). 2. ROUGHLY CHOP the ice cream using a large knife, then mix it with the chopped strawberries and the shortbread pieces. Spoon half of the mixture into the loaf pan, patting down firmly so there are no air bubbles. 3. DOT the caramel sauce on top of the ice cream, then cover with the remainder of the mixture, firmly smoothing over the surface. Fold over the overhanging plastic wrap and place the pan in the freezer for several hours or overnight, until the ice cream very firm. 4. TO SERVE: Gently lift out the ice cream using the plastic wrap as handles, and remove the plastic wrap. Allow to soften for 10–15 minutes as needed; then cut slices with a large knife. 5. PLATE the slices with an optional drizzle or dotting (use a squeeze bottle to create dots around the rim of the plate) of caramel sauce or strawberry purée. More than 5,000 recipes can be found at Waitrose.com/recipes.